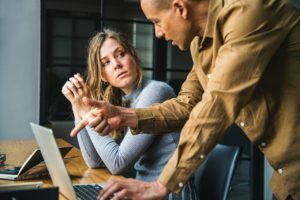 While most of us like to think that bullying is something that only happens in the school yard, the sad reality is that half of all Aussie employees will experience workplace bullying during their careers. It’s important to note that reasonable management actions (such as decisions regarding poor performance and disciplinary action) don’t constitute bullying. Bullying and discrimination are also two different issues. While this definition may lead us to think of bullying as an individual or interpersonal issue, research shows that broader factors, such as poor organisational culture and a lack of leadership, are actually the main drivers of workplace bullying. Bullying in the workplace can have a range of negative effects. Targets of workplace bullying have higher rates of depression, anxiety and post-traumatic stress disorder (PTSD). No individual should have to encounter a hostile work environment, and, on a larger scale, bullying contributes to a toxic workplace and can increase absenteeism and reduce productivity. In 2010, the Productivity Commission found that bullying at work costs Australian organisations between $6 billion and $36 billion a year in lost productivity. With this in mind, it’s clearly in businesses’ best interest to actively stop workplace bullying. While everyone is legally protected from workplace bullying, research suggests it is young males who have limited social support at work, and those who work in stressful environments, that are most at risk. An important step in stopping workplace bullying is recognising when it happens and actively taking steps to put an end to it. As bullies often rely on intimidation and fear to silence their victims, knowing the signs is crucial in addressing the issue. Employees who are being bullied may suddenly have an increase in sick days or take leave in order to avoid the toxic environment. This is a direct consequence of bullying in the workplace and one of the more obvious signs that there are larger issues. On the other end of the scale, employees may continue to attend work but reduce their productive output. When their mental health is compromised due to bullying, an employee will continue to show up to work but be unable to focus, have a short attention span or be forgetful of tasks throughout the work day. Presenteeism is becoming more and more common for workplaces that are psychologically unsafe. As stated before, institutional issues such as poor management can be a massive driver of workplace bullying and often, employees will simply move out of the organisation rather than attempt to change the culture or stop the bullying. As a result, high staff turnover can be a sign of a toxic workplace and a bigger issue at play. How do we deal with workplace bullying?